Guarantee safety to our clients and transmit our skills. We love our work and we want you to have an unforgettable experience with us. For the mountains and for what we do. The history of the Cortina Alpine Guides started when Paul Grohmann, a Dolomite explorer and founder of the Austrian Alpine Club, consigned the first registration book to a guide called Francesco Lacedelli over 150 years ago. A tradition which has taken us through the years, with extreme passion for our territory. 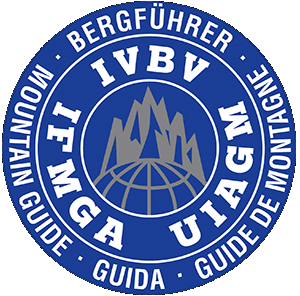 For who wants to be harnessed, for who wants to do a ferrata, cross a mountain ledge, walk through an uncontaminated valley, the Cortina Alpine Guides and Mid Mountain Guides are the right people to count on. We are all subscribed to the Regional and National Guides Association.